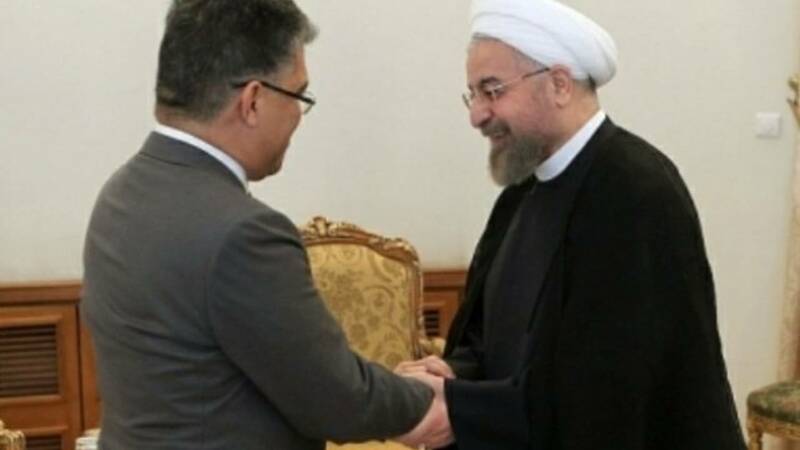 Venezuelan Foreign Minister Elias Jaua (left) traveled to the Iranian capital of Tehran on Monday to meet with Iranian president Hassan Rouhani (right), aiming to strengthen diplomatic relations between the two nations. Venezuelan Foreign Minister Elias Jaua traveled to the Iranian capital of Tehran on Monday to meet with Iranian President Hassan Rouhani, aiming to strengthen diplomatic relations between the two nations. The top Venezuelan diplomat was in Tehran to attend a one-day meeting of the Non-Aligned Movement (NAM) Ministerial Committee on Palestine, held in the Iranian capital. President Rouhani thanked Caracas for adopting what he considers "very good stances" on Middle Eastern issues, particularly the Palestinian issue. During the meeting, Iran reaffirmed its support for the Bolivarian government. "We must all join hands and unite against enemy plots and prevent the enemies from putting pressure on the developing nations," said Rouhani. To date, Venezuela and Iran have signed 265 agreements deriving from 58 projects in the industrial, environmental, agricultural, commercial, educational, sports, housing, cultural, energy and scientific and technology areas. Both the Iranian government and the Venezuelan government agree in their support for the Palestinian cause and not recognizing the legitimacy of the state of Israel. In its strongest action against Venezuela, the State Department announced a travel ban for officials of the socialist government it said committed human rights abuses during a crackdown on opposition protests. However, the Florida congressional delegation, which has been out front on the issue, called for stronger sanctions against Nicolas Maduro's government. The travel ban comes just days after Venezuela secured the release of a former Venezuelan general who had been detained in Aruba at the request of U.S. authorities. The U.S. has accused Hugo Carvajal, the former head of Venezuela's military intelligence, of using his high-level position to protect drug traffickers. Carvajal was expected to face extradition to the U.S. Instead, Aruba released him and he flew back to a hero's welcome in Caracas. The State Department accused Venezuela of using threats against the Dutch Caribbean territory to circumvent international justice, a charge denied by Venezuelan officials. The measure does not target every-day Venezuelans, only 24 high-ranking Venezuelan officials including Cabinet ministers, senior judges and high-ranking military, police and National Guard members. The State Department's announcement cited the months-long street protest movement that left dozens of people dead earlier this year and said the Venezuelan government had responded in many instances with "arbitrary detentions and excessive use of force." Jaua called the new sanctions a "desperate" act. "We understand all these attacks as a desperate cry from someone who knows that the world is changing and they have no way of relating to it," said the foreign minister during a news conference with national media. "It's just another retaliation from the U.S. government against Venezuela's role in shaping a new world." U.S. Sen. Marco Rubio, R-Fla., a chief advocate for increased U.S. involvement in Venezuela who proposed similar sanctions in May, called the travel ban a "first step" and urged the administration to do more. Others on Capitol Hill said Congress should toughen the State Department's measures by adding family members to the list of banned Venezuelans and freezing assets.